In these days of political, environmental and social turmoil, I often find myself feeling overwhelmed, angry, scared and hopeless. The Coat of Hope is my antidote to the uncertainty and fear I feel, and that I hear around me. I believe that it is imperative to be active right now against the injustices happening daily, but it feels equaly important to focus on the future that we WANT to see. This project is an invitation to envision the world that we aspire to live in; to spend time in the possibility of hope; and to share with each other our dreams for our future. Building connection feels like an important part of our path forward, thus this is a participatory project. The Coat is being created with groups of all ages across the country, and eventually across the world as I invite people, via social media, to send me their hopes. 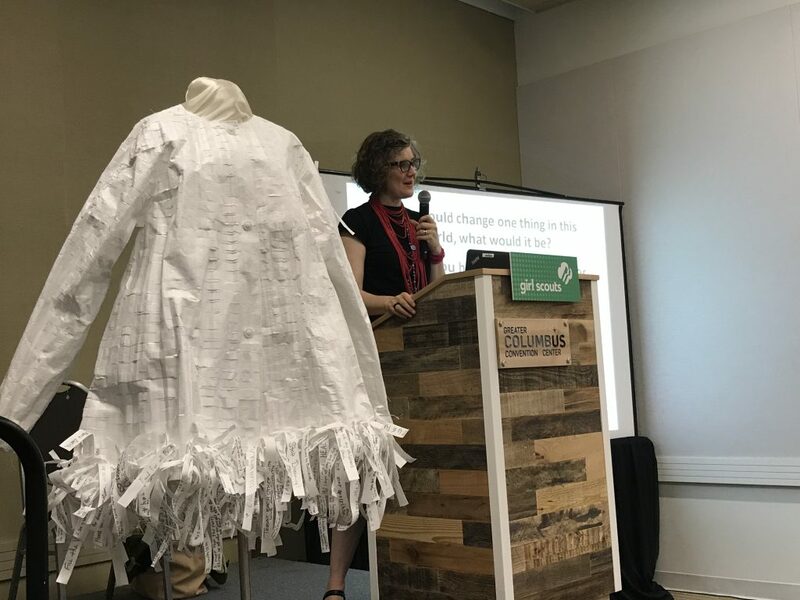 The Coat of Hope is made of up-cycled white plastic film, a high-density polyethylene material used for many purposes including to protect buildings during construction. It looks like white paper, and comes to me on “end-rolls” (the plastic or paper at the very end of a roll that is not usable in the manufacturing process) from a company called Beacon Converters. They commissioned me to make a wedding dress from this material to help raise awareness about the recyclability of plastic film specifically in the medical industry. The base of the Coat is sewn from pieces of the white plastic which I folded accordion style and cut with hundreds of small incisions horizontally. Thousands of 10×1 inch strips, slit half-way down the center to create two flaps, will be tied in a double knot to the Coat. Before the strips are attached, people are invited to write their hopes onto them using silver ink, answering the question: “What do you hope for the planet, for humanity, for the future?” I am gathering “hope strips” at community events, during presentations, in classrooms and via social media for the next several years. Hope strips gathered from around the country. The process of reading and attaching people’s hopes to the Coat is quiet, sacred and meditative. In this process I find myself wondering: Do our hopes hold energy and power? Can they contribute to planetary justice? 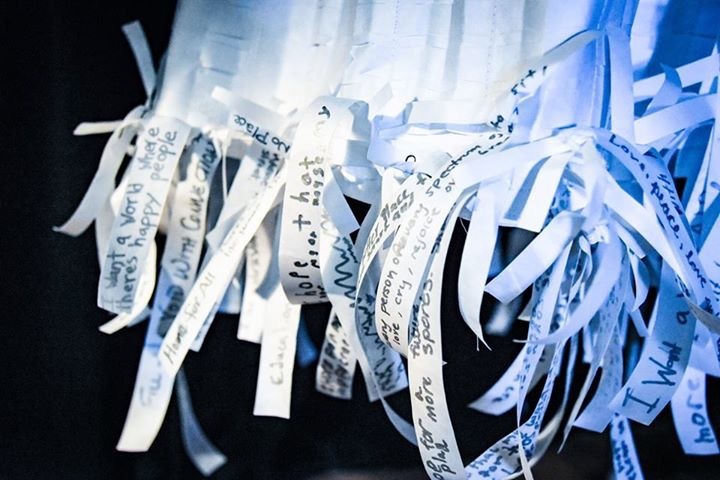 The completed Coat will be covered with thousands of hope strips and appear as large white fluffy apparitions, a sublime shifting cloud, transformative like hope. 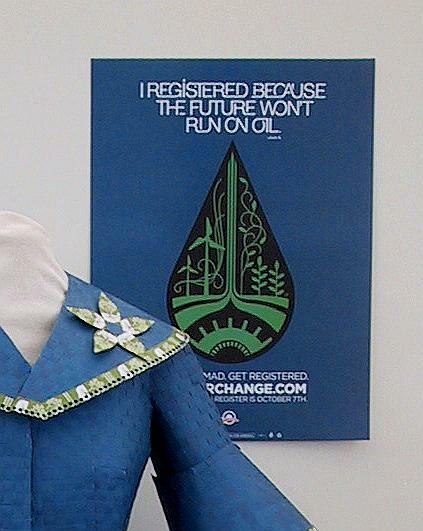 I hope to wear the Coat in marches and demonstrations where people gather for environmental and social justice. I imagine holding sacred space in these spaces, meditating on the visions created by thousands of people who add their hopes to the Coat, whispering their wishes into the future. I want this to become an historical item that both documents this time of intense challenge and hopefully contributes in some way to a new era. The Coat of Hope is currently on view at the Washington State History Museum in Tacoma, WA through December 6, 2018. It, along with three of my other sculptures, is part of a fabulous exhibition called: “Make/Do: A History of Creative Reuse” If you are in the area or passing through I highly recommend stopping in to see it. The completed Coat of Hope will be displayed in my upcoming solo exhibit in the Atlanta Airport in February 2020. In 2011 the Atlanta International Airport exhibited 21 of my “trashion” sculptures for a year in International Concourse E. The Art in the Airport staff reported that: “It was one of our most well received exhibitions!” and have invited me to install a second show of new work from the last 5 years. The success of my past work suggests that by raising awareness about environmental and social justice issues, art can be a catalyst for change. My intention for this project is to elicit hope and connection to increase understanding and trust towards planetary justice. I hope that awareness of these connections can foster understanding that will birth further actions towards compassion, creativity and love. Please send me your hopes, either by posting them on my facebook page (while you are there plaese “like” my page) or emailing them to me at Nancy(at)RecycleRunway.com. I will transcribe them onto strips and attach them to the Coat. would look and feel like if your hope were realized. Thank you for participating in this experiment with me! Nancy leading a “hope meditation” at the Washington State Historical Museum. PLEASE NOTE: The comment section below is not working- please post your hopes on my facebook page. Thanks!